Washington D.C. 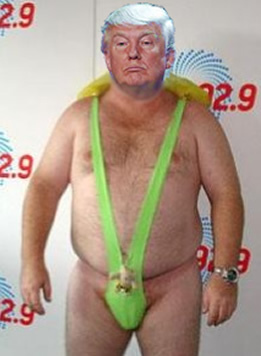 In a recent Tweet, the president expressed regret at not being able to wear a mankini. In response to inquiry as to the nature of this tweet, our White House source informed us that Vice President Mike Pence has reminded the President on several occasions, that mankinis are not presidential, and that it would undermine his credibility, in addition to the White House in general. This came as a result of several White House staffers expressing discomfort at seeing Donald Trump walking around the White House wearing nothing but his mankini and yelling "eeees niiiice!" Eventually they compromised, and agreed that President Trump could at least wear his mankini indoors, but nowhere else.